Most surprising movie, Marvel Cinematic Universe category. Everyone knew Avengers Age of Ultron would be one of the summer's big movies. 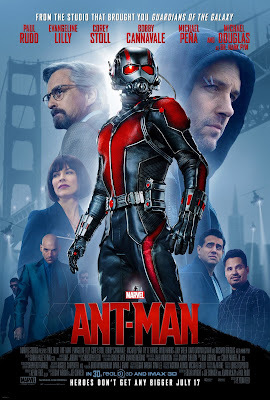 I enjoyed it, although it wasn't nearly as fun as the first Avengers flick because we had to inject way too much Joss Whedon-angsty stuff into the movie. What I didn't expect was how much I enjoyed Ant-Man. It reminded me a lot of the first Iron Man movie in the way it was constructed. Plus, it may be the most humorous of all the MCU movies. Every once in a while, it's nice to have a superhero movie where the stakes are huge for a single character but don't hinge on whether or not the world will get destroyed. I highly recommend it. Largest jar of peanut butter I've ever seen, big jar peanut butter category. My father retired this year and now enjoys the slow-paced life of a retiree with three grandchildren who live less than 30 seconds away. Dad ate a lot of peanut butter sandwiches at work, and his coworkers certainly noticed. 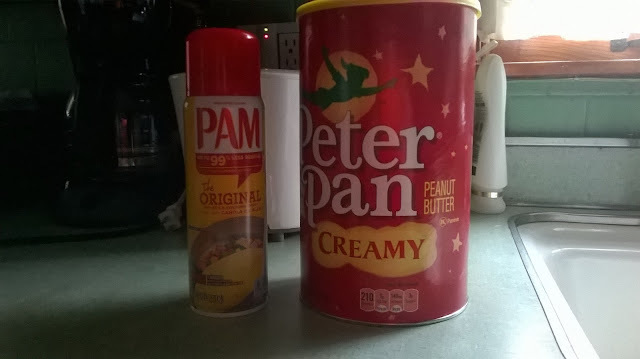 Upon his retirement, one of them gifted him this large jar of Peter Pan peanut butter. I imagine this lasted about two weeks, tops. Best family outing, retirement category. Not only did my father retire in September, my mother retired in June. That meant the Adams family (if you hum the theme song, I will Kylo Ren you) took a trip to celebrate the occasion. My brother and I bought tickets to see the Cincinnati Reds play the St. Louis Cardinals at Great American Ball Park. We got some bonus baseball: the previous night's game couldn't be completed, so they played the rest of it before our game started. 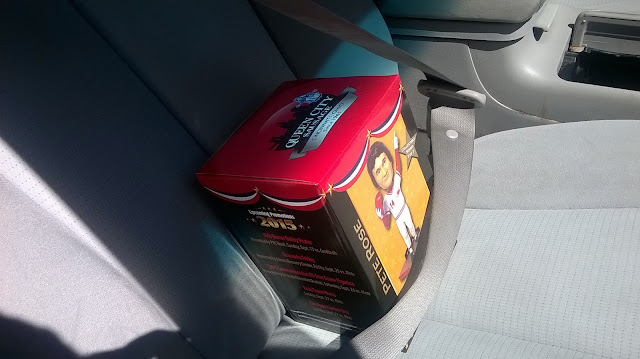 The "second" game commemorated Pete Rose night, and we all got Pete Rose bobbleheads. 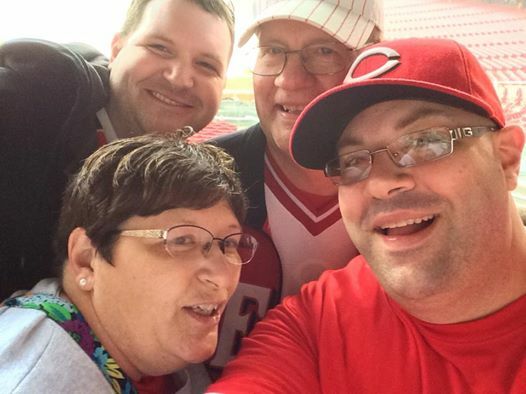 We don't get to do much as a family these days, so it was nice for Mom, Dad, Greg, and I to have a throwback weekend together at the ballpark. Most satisfying movie experience, space opera category. "There has been an awakening...have you felt it?" Star Wars is back (as if it ever really left us in the first place). Star Wars: The Force Awakens was by far the most satisfying movie experience of the year. Not only did we get a lot of high quality Han Solo and Chewbacca action, the new characters were great, the movie had a ton of heart, and it's probably the funniest Star Wars movie out there. Seeing the old gang back on the big screen was an emotional experience for me, as I've always been a huge fan of the original trilogy. I even saw each of the prequel movies multiple times. At one point in my life, I owned all of the action figures from the "Power of the Force" line and had read each and every one of the expanded universe books. After college, I cooled on those things a little bit, but the new movie has really reignited my love for the franchise. I think The Force Awakens deserves its own post one of these days. Maybe I'll write one after I see it...again. Best website inventory stalking moment, Star Wars: The Force Awakens toy category. 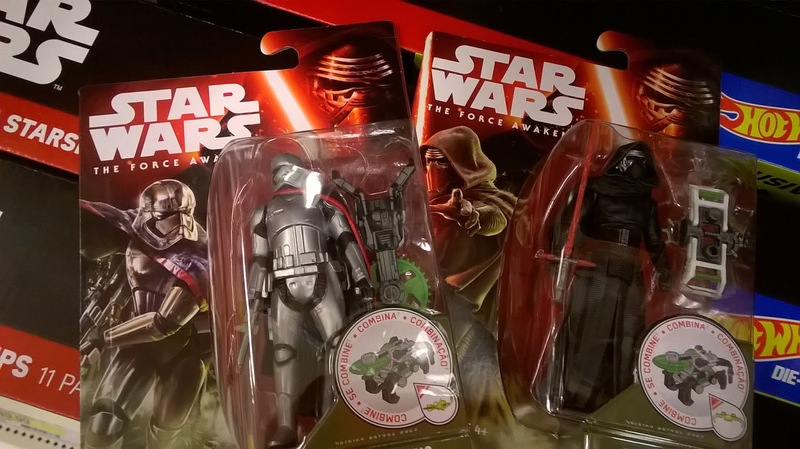 Two new Star Wars characters caught my attention when the new toys were released earlier this year: Kylo Ren and Captain Phasma. I thought both looked cool, so I wanted to get their action figures. This proved to be a pretty daunting task. I think everyone wanted these two characters. 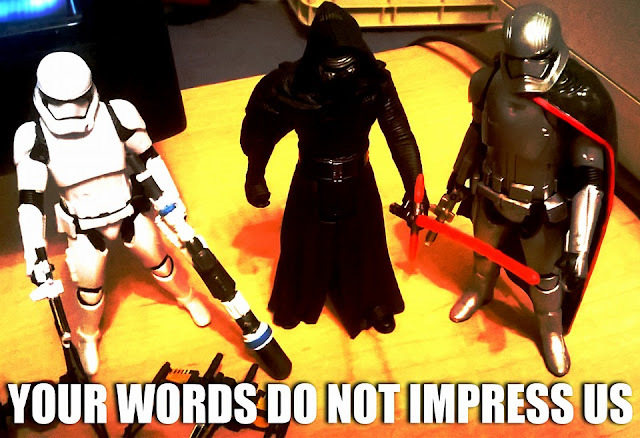 I couldn't find them anywhere; at one point, Kylo Ren and Captain Phasma were going for $60 bucks each on Amazon! I stalked the online inventories of Indianapolis-area Walmart, Kmart, Target, and Toys R Us stores to see if anyone had them in stock. No dice. Both figures were always "out of stock." Then, one magical day, I checked the Target website and Kylo Ren was in stock at one of the Target stores in Greenwood. I happened to be on vacation that week and went to retrieve them. I found two of each figure there and bought the other set for one of my friends, who was just as excited after scouring Chicago-area stores for them. Sometimes a treasure hunt is REALLY exciting. Is this an Xbox One or a cardboard box filled with a lack of productivity? Most self-indulgent Christmas gift, home entertainment category. I wasn't sure I would hop into the "next gen" of videogame systems. My Xbox 360 has been collecting dust upstairs ever since the summer, and I felt the Xbox One was overpriced when it was first released. Then, the Microsoft Store offered a killer deal for the holidays: they slashed $50 off their console bundles, threw in a free game, and offered a $60 store credit for anyone who bought the system. I thought the deal was too good to pass up, so I talked it over with my wife and decided to go for it. I'm glad I did. The Xbox One is a great system. I bought the Tomb Raider bundle, which came with both Tomb Raider games. 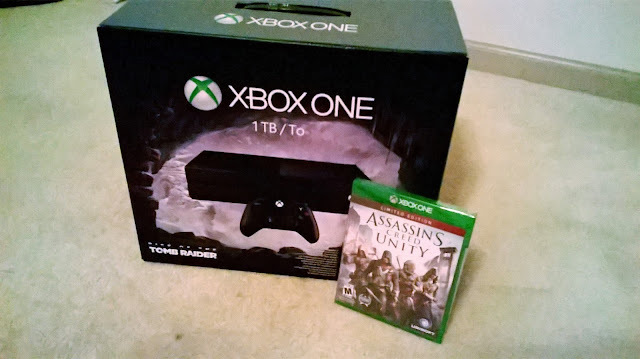 The system also came with Assassin's Creed Unity. I used the store credit to buy Batman: Arkham Knight and Lego Batman 3. I ended up getting some gift cards for Best Buy, where I bought an extra controller, a charging station, and a media remote. Basically, the Xbox will replace the Roku since it has most of the same apps. This year, they're also supposed to add DVR functionality for over-the-air TV, which will be great since finding a good OTA DVR is challenging. So far, I've played through the first Tomb Raider game, and it's fun to be back in the world of gaming. Now I'll have to juggle that with writing. They mock me every time I write. Every. Stinking. Time. Writing year in review, still nothing new published category. I was pretty darn productive in 2015! I wrote four novels: two of them in a superhero series I started a couple years ago, one about a drug that extends a person's lifespan, and a young adult fantasy novel about a vaguely medieval world filled with magic and unicorns. If you check out my Twitter stream (you don't tweet enough, @statomatty), you'll see a pretty consistent tally of word counts. When I'm on a project, I'll often write six or seven days during the week. I took a break in November because I needed to go back and polish some of my existing work instead of starting something shiny and new. In addition, I spent some time submitting work. I got a few bites on one of my projects, but nothing came of it. I do need to get back to writing on a consistent basis. If I hadn't stopped in November to do some revisions, I'd probably have written a fifth book in 2015. I will get back at it in 2016. Strangest obsession, it's clearly a cult category. The HBO documentary Going Clear absolutely captivated me. I'd heard of Scientology before, but I didn't quite grasp how nutso the whole thing was. After watching the HBO doc about the "religion" (ahem) created by science fiction writer L. Ron Hubbard (LRH! ), I couldn't get the whole concept out of my mind. I read the book that served as the basis for the documentary and got sucked into the internet rabbit hole that is Scientology. The whole thing is unbelievable. See, most religions tell you the creation story right away. It's kind of the first thing you learn about. In Christianity, you pretty much start with Genesis and go from there. God created the Earth, you know? Well, in Scientology, they hold the origin story from you until you reach a certain level. After you spend thousands upon thousands of dollars and endure countless "audits," you learn the "creation" myth of Scientology, which involves an intergalactic warlord named Xenu. I won't get into it, but this Wikipedia page has a nice summary if you feel like gouging your eyes out. Most surprising Netflix addiction, Matt and Anne category. 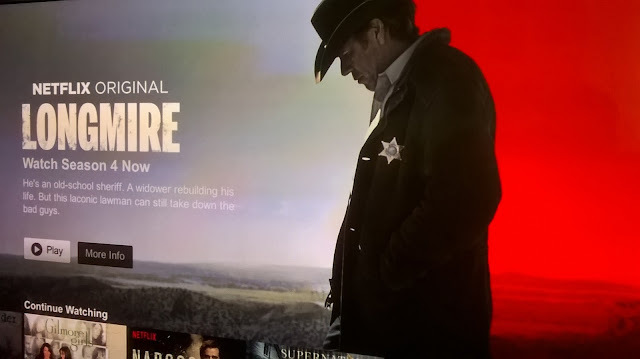 Anne and I fell in love with the TV show Longmire. We binge-watched the series in just a few weeks. No one was more excited that Netflix was going to produce a fourth season than the two of us. When it was released, we couldn't wait to blow through the new episodes. Netflix picked up the show for a fifth season, and you can bet we'll watch it when it comes out. I'll also make an honorable mention with Halt and Catch Fire. Anne's in love with Lee Pace, so that's pretty much why we started watching it. Turns out, it was a great show. Another really good one: Turn. We liked both of these shows enough that we bought season passes for their second seasons because we couldn't wait for them to make it to Netflix. Depressing sports news, Colts and Reds category. We said goodbye to Reggie Wayne this year, and he briefly toyed with the idea of joining the Patriots. After seeing the team overpay for Andre Johnson, you wonder why they just didn't keep Reggie around. So that was depressing. Also depressing: a season that reminded me of such quarterbacking luminaries as Kerwin Bell, Paul Justin, Kelly Holcomb, Kerry Collins, Curtis Painter, and Dan Orlovsky. The Colts let their star, Andrew Luck, get pummeled and miss half of the season. Then his 40-year-old backup, Matt Hasselbeck, got pummeled. His backup, Charlie Whitehurst, strained his hamstring and ended up on injured reserve. The team with (delusional) "Super Bowl aspirations" instead ended up as a complete disappointment. I think Jeff George is starting Week 17 against the Titans. That guy's always waiting by the phone, you know? They still have a chance of making the playoffs, but I think it involves a few teams winning and a human sacrifice or something. And then you have the Cincinnati Reds. A few years ago, they had this great core group of players. Now, they're just terrible. They traded fan favorite Todd Frazier in a move that makes me sick to my stomach. The team is trying to move Brandon Phillips as well, also making me sick to my stomach. Closer Aroldis Chapman got shipped to the New York Yankees. I'll miss the flames on the tall stacks for his 103-mph fastball, although losing him isn't the gut punch of the other two. Basically, the Reds are a mess. I'm sure they couldn't afford Frazier once his contract was up, but you hate to lose a player you brought up through your farm system and who became a fan favorite. Best YouTube discovery, uproariously funny anti-highlights category. The 2014-2015 New York Knicks "highlights" video is a thing of beauty. Set to "One Shining Moment," it shows the "best" of a terrible basketball team. I laugh until I cry every time. Most ambitious undertaking, home media server category. I watch a lot of Seinfeld. I have the complete series on DVD, but I HATE flipping through and switching discs and hunting for certain episodes. I solved that problem by digitizing all the episodes and putting them on a Plex media server. Now, I can use the remote to find the episode that I want. Anne and I watch "The Chicken Roaster" episode way too much. Very few products actually change your life. Plex changed mine. After that, I went completely bonkers and digitized my entire DVD collection. Every movie I own is now available on Plex and accessible at the touch of a button. I've streamed a lot of my movies on the Roku, though the Xbox One will probably do the heavy lifting from here on out. The only drawback: I don't have a Blu-ray drive for my PC, so I can't digitize my Blu-ray discs. Still, a small sacrifice for a great user experience. Best dates, married couple category. Anne and I had our share of great times this year, but a few definitely stick out. 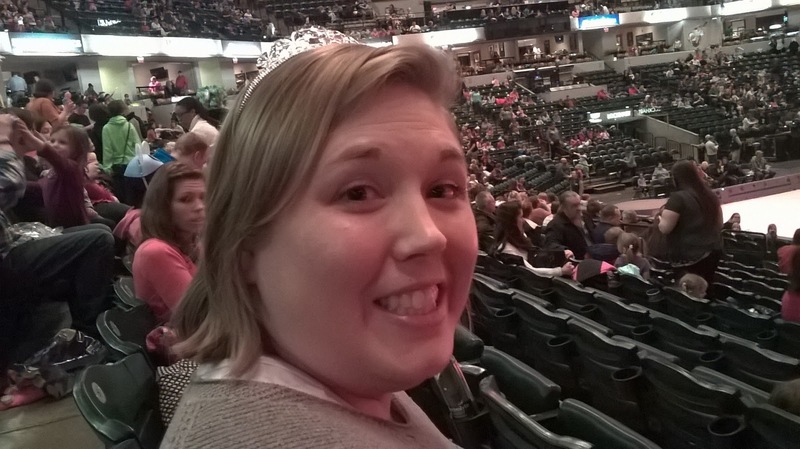 In January, I took Anne to see Disney on Ice. She's seen it before, but this time I went with her. She wore a tiara and everything, just like all the little girls who were there with their parents. During a vacation in March, we visited the new Giordano's on the north side. We've been to the one in Chicago a couple times, and we really enjoyed the one in Indy. Actually we need to go back, come to think of it! In December, we went to see A Christmas Carol at Beef and Boards. I love that show! My favorite version is the one that aired on TNT in the 90s with Patrick Stewart (Anne gave me that on DVD this year!). The Beef and Boards production was pretty great, though, and it came with a dinner buffet. Carved roast beef for the win! And of course, we also saw Star Wars in a packed theater in Greenwood, and that was a lot of fun. I especially enjoyed the postgame discussion at the Oaken Barrel. Best meme, requested by Anne category. 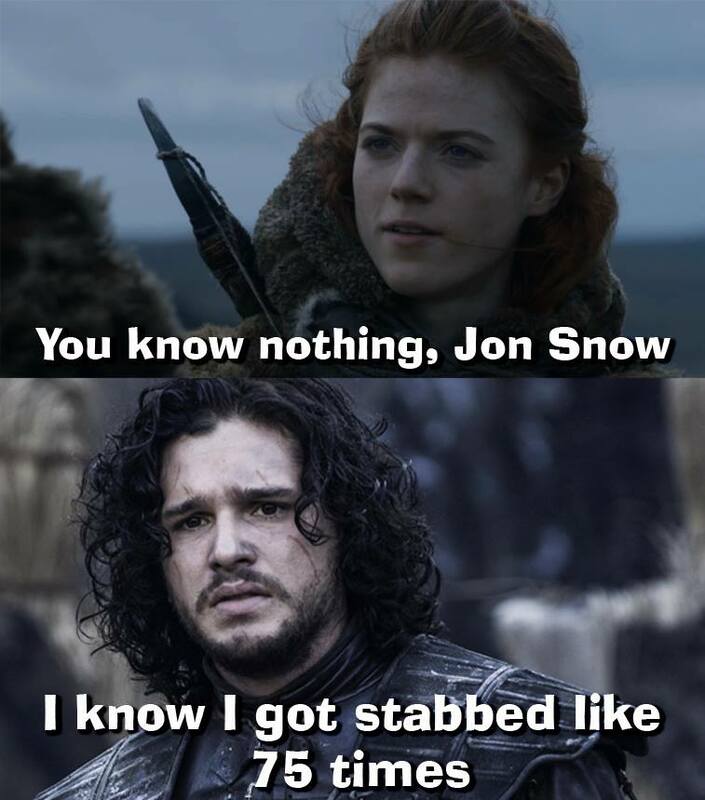 We are devoted Game of Thrones fans, and we were devastated by what happened to Jon Snow. I made an off-the-cuff remark after the episode: "You know nothing, Jon Snow"/"I know I got stabbed like 75 times." Anne demanded that I make it into a meme, and so I did.